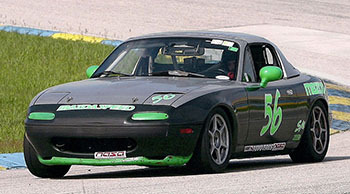 Nick drives the beautiful black, silver and green #56 Rossini powered 1997 Spec Miata. Being a total gearhead, Nick has built and prepped his own cars, everything except the roll cage, which was done by Jeff LaBounty at AutoTechnik. Nick’s favorite track is Daytona, and while he mainly races in Florida, he has made out of state trips to VIR, Barber Motorsports and Mid Ohio. His goal is to travel around the country and race as many tracks as he can! Nick’s girlfriend Heidi is his Crew Chief and his biggest fan! His immediate family come out once in a while to watch him race. According to Nick ‘Racing is more than a hobby for me, it’s a lifestyle’. 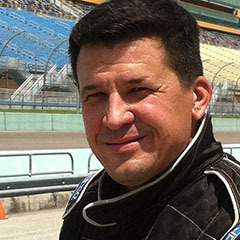 Nick’s most memorable race was winning the $1,000 cash prize this year in the Miata Madness race at Homestead. In 2012 he was leading the race when his transmission failed so it was particularly satisfying to win it this year. Nick has several Spec Miata wins and top 5 finishes on his racing resume.